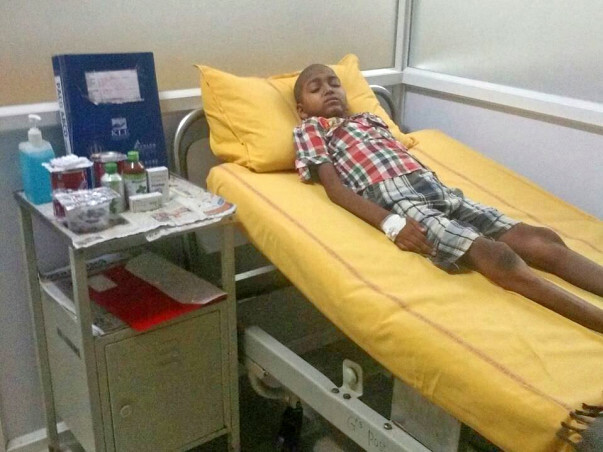 As Vikas lay on the bed, a loud, angry voice disrupted the silence of the hospital. Vikas recognized that voice too well and his eyes welled up with tears. His father had finally come to visit him for the first time, but he was drunk. He stood by Vikas’ bedside, yelling and cursing. Vikas began crying while Jayashri held him till the voice faded away. Vikas not only has to deal with the physical pain of cancer, but also the mental trauma of his alcoholic father. Jayashri’s faith is now crumbling. With no emotional or financial support from her husband, she has nothing left to save her 9-year-old son from cancer. 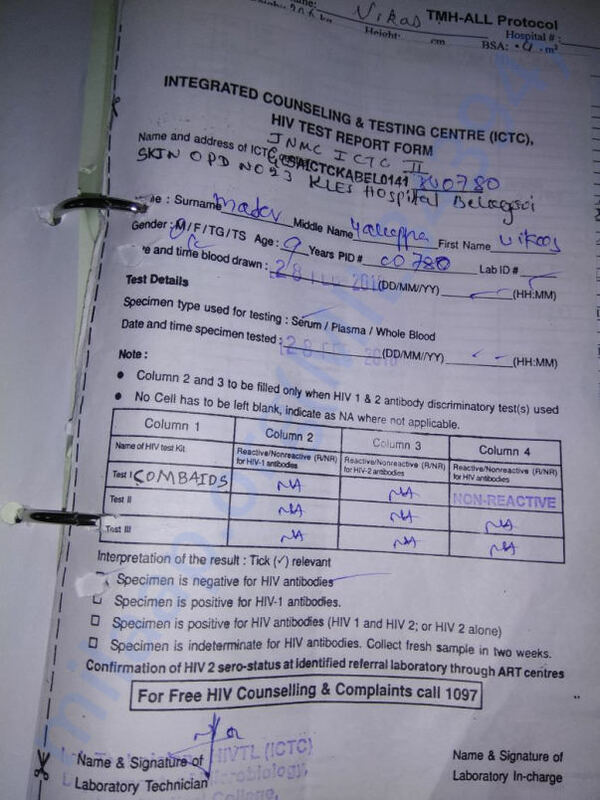 Vikas was diagnosed with blood cancer in February this year after he complained of severe body pain and had a high fever. 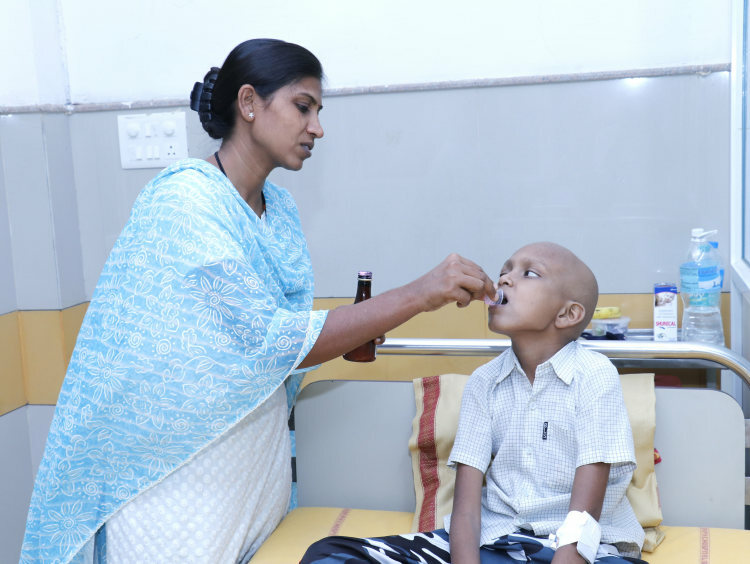 Jayashri soon learned that her youngest son has blood cancer. 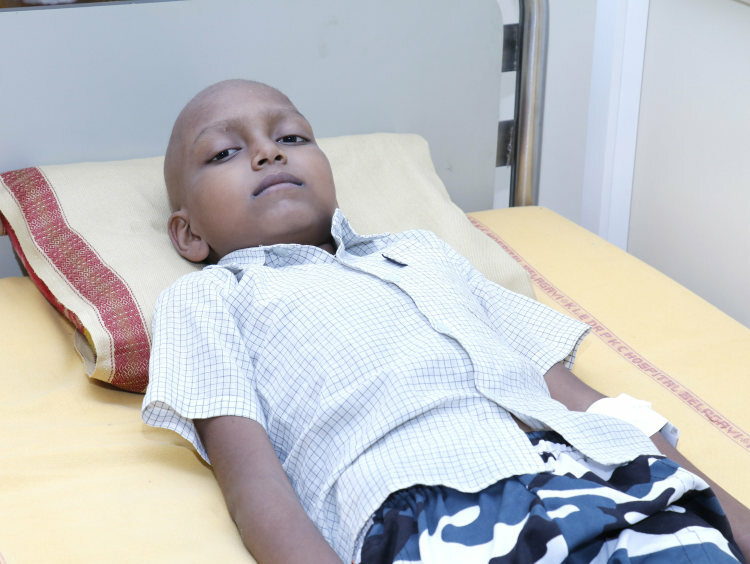 Vikas has completed two cycles of chemotherapy so far but needs to continue treatment for longer to get healthy again. His only chance to make it is to complete the course of his treatment. Jayashri worked as a teacher in a small school in their village, Tadakal. She earned Rs. 3000 per month and somehow managed to keep her family going. 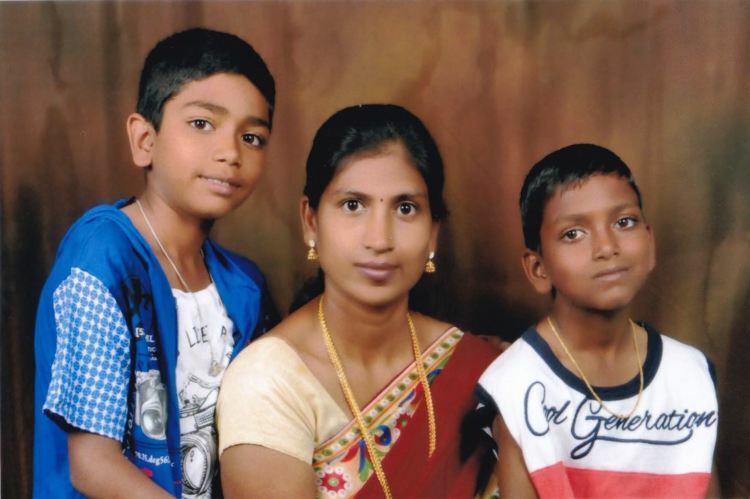 However, after Vikas’ diagnosis, Jayashri had no option but to quit her job. 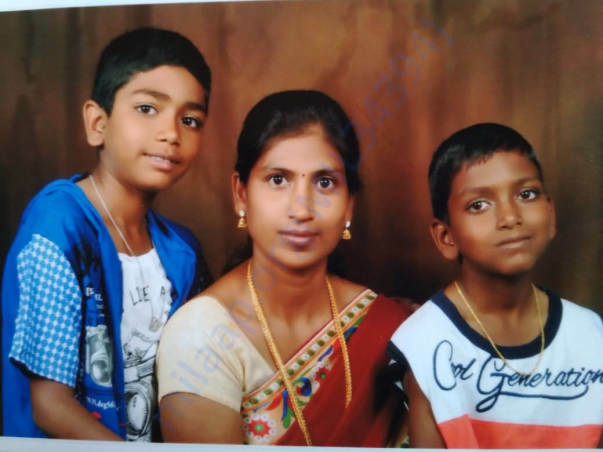 With an absent father and no other income, Jayashri has been carrying the financial burden of his treatment all on her own. Unfortunately, as desperate as she is to save her son, she just doesn’t have the means to continue his treatment any longer. Vikas has completed two cycles of chemotherapy so far, but his fight isn’t over. 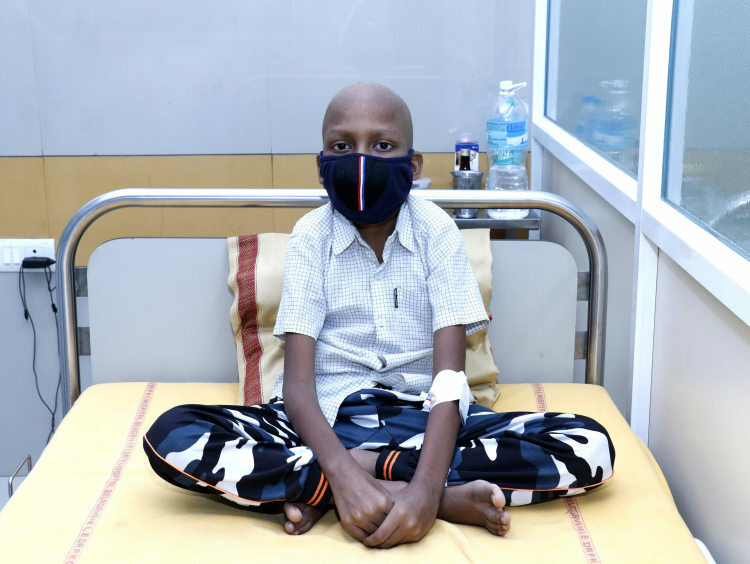 He’s only 9-years-old and blood cancer is making him weaker by the day. 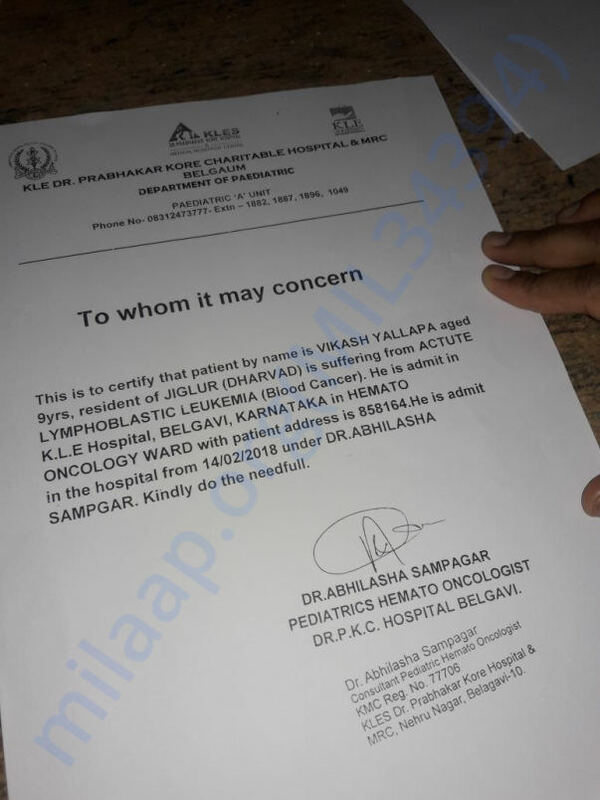 He needs to continue treatment for another 2 years to beat cancer, but Jayashri has nothing left to save him. She will be forced to stop treatment without funds, and might her lose her son forever. She needs your help to save his life. 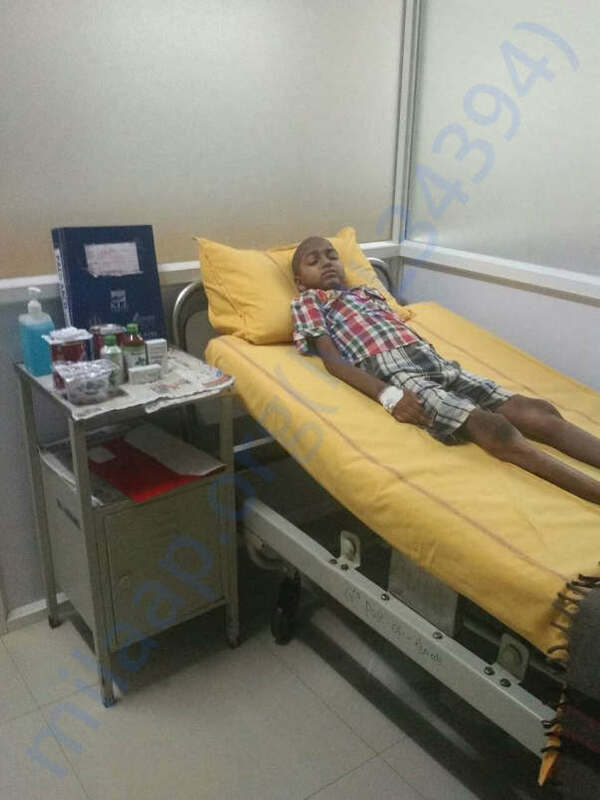 Vikas is currently still undergoing the third cycle of chemotherapy. 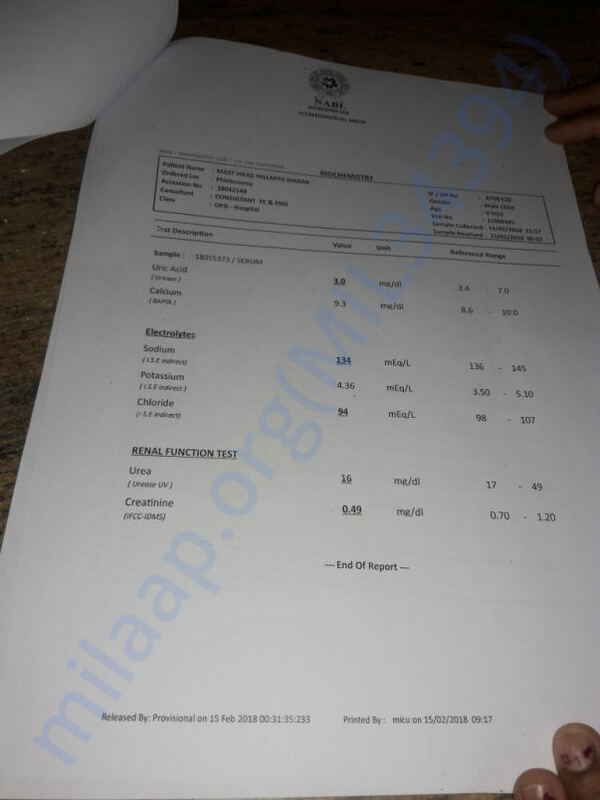 His counts dropped drastically while he was being administered the chemotherapy treatment because of which he had to be then first treated to increase his count so the chemotherapy could continue. We shall keep you posted. Thank you everyone once again. 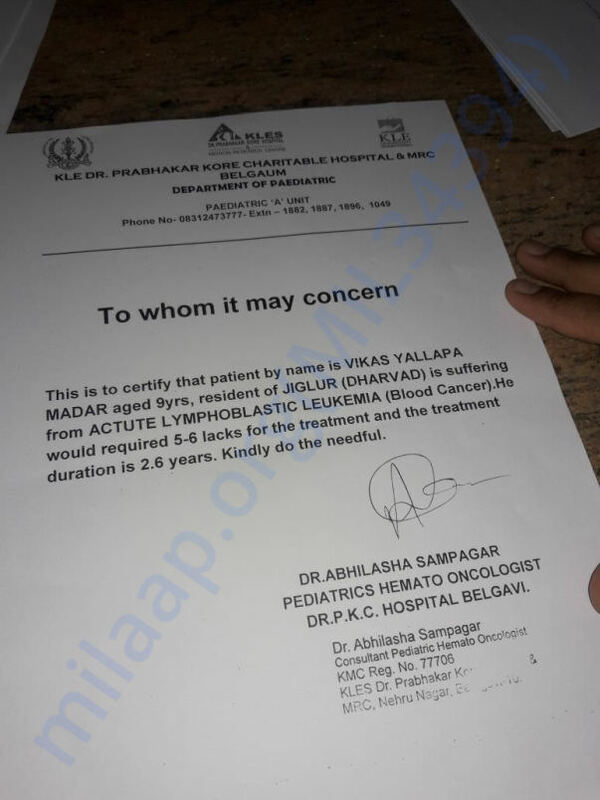 Vikas is currently undergoing the third cycle of chemotherapy. He is getting better now. He is still hospitalized. The doctors have told us that he might need a total of six cycles of chemotherapy. We are all hopeful about his recovery. Please keep praying for him and supporting him. Thank you for the support shown so far. 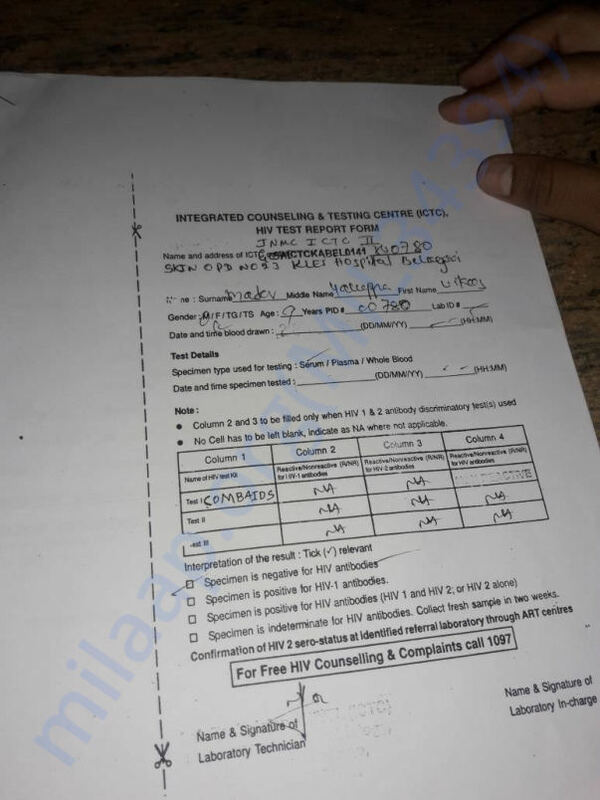 A quick update in Vikas's health: His condition is going critical day by day. 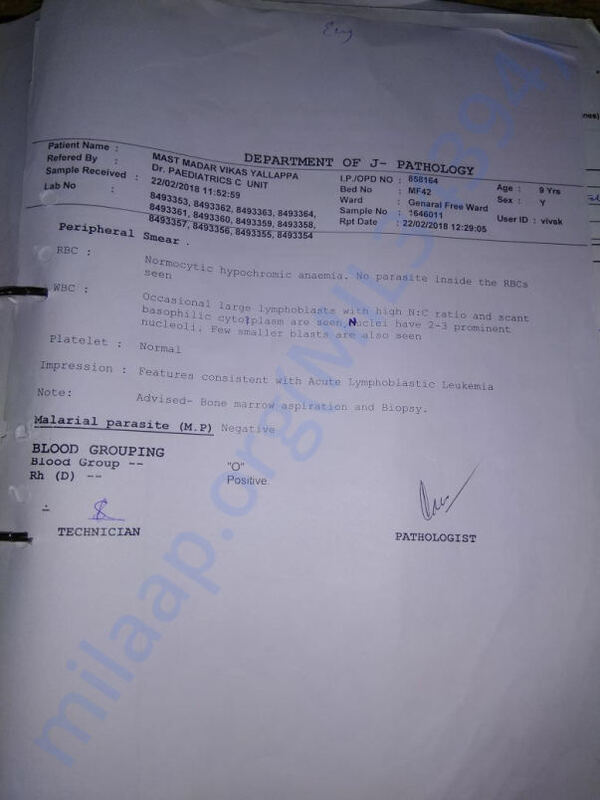 He is going into his 3rd cycle in the blood cancer treatment. He needs blood donations frequently. Going through the symptoms of vomitting, fewer and backpains. We are withdrawing some funds currently for his treatment. Continue to support and share the campaign. Praying for his recovery soon. I feel sorry for wrhat she has to go through, with the son battling blood cancer, along with the father that is lacking-support, harms others, and anger out bursts while drunk, I hope others take the time to consider, spreads the message, and helps her and the son out, I wish you the best, and hope you get better.